A good method of testing or troubleshooting internet connections is the running of ping or trace route tests. This can help narrow down where a non-connection or slowed connection is occurring. A PING test will send a series of short, small, connections to a web site (or IP) address and monitor both completion and response time. Typically 4 pings will be sent and received, although this process can be edited to send continuous connections over a period of time. A TRACE ROUTE test will run a normal connection through the Command/Terminal box, giving details of the 'hops' taken, and response times for each one. A hop is computer, or server, that is used to route your device to the chosen website or IP address. There can typically be anything from 5 to 20 hops on any website request. While the process for running each test is the same, the method of starting them slightly differs across Operating Systems. Directly below are the instructions for various Windows Operating Systems. If you are running an Apple Mac, please scroll down the page or jump to the Mac section of this guide. 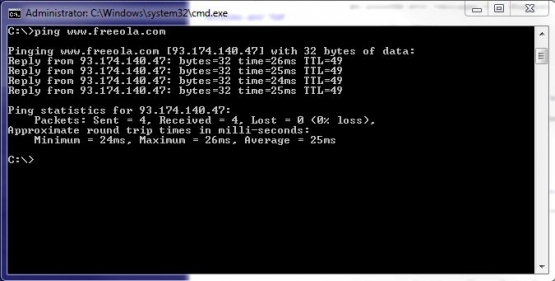 A ping or trace route test can only be run from a command prompt box (sometimes referred to as a 'DOS Box'). The process of opening this feature varies slightly between Operating Systems, please follow the instructions below that relate to your machine. All instructions assume your machine is powered up, and you are logged into the main/administrator account. Click the 'Start' button, found typically in the bottom-left hand corner of the screen. On this menu, select 'Run', a small window should now open. In this window, type 'cmd' or 'command' and press Enter on your keyboard, or the 'Run' button on-screen. A small, black, window should now appear. This is the Command Prompt. Click the Windows icon, found typically in the bottom-left corner of the screen. The 'search' function should be selected automatically, in this type 'cmd' or 'command' and press enter on your keyboard or, after a brief wait, select the 'cmd.exe' icon from the search results. While in the 'Metro UI', type 'cmd' and press Enter on your keyboard. The system should automatically begin searching and open the Command Prompt. From the provided list, select 'Command Prompt (Administrator)' to open the Command Prompt. Your computer will now send a series of four pings to our web server. You will then be presented with the result of each ping attempt, along with a summery of the statistics. If your problem is intermittent, and you would like to test over a period of time, it is possible to run multiple ping requests to a website. If you require more than 4 pings, simply enter '-n x' after the web address. For example, if you wanted to ping the Google website 25 times, you would enter 'ping www.google.co.uk -n 25'. Should all ping requests fail, timeout, or lose packets, it may be indicative of an internet fault. 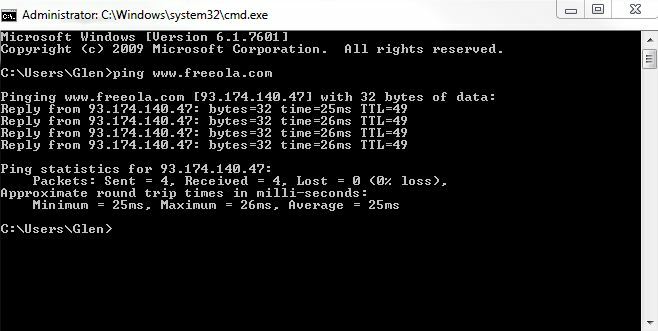 If this happens, we would next advise replacing the 'www.freeola.com' section of the ping test for the IP address of your router. If you are unsure of what this may be, please call Freeola Support on 01376 55 60 60 and a member of staff will be happy to assist you in obtaining it. Your computer will now run a connection test tracing the route your computer is taking to accessing our site. This can take up to a minute or two to fully complete, you will be presented with a 'Trace Complete' message once this is done. This type of test is extremely useful for testing whether an internet connection, or website, is working as you are able to pin-point the location of any issues. Occasionally 'hops' will time out (displayed as a line of asterisks) and you should see a new route being tried to reach the destination. If your connection is regularly failing within the first one or two hops, this could indicate a potential internet connection issue. 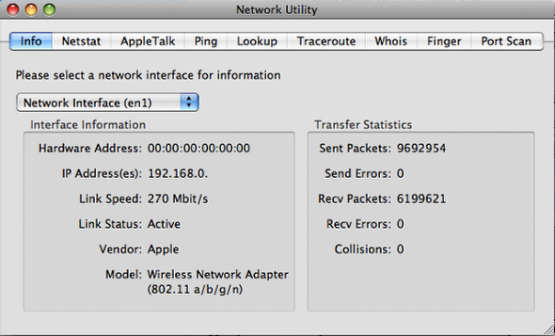 From the top navigation of the Network Utility window, select 'Ping'. You will be presented with a field asking for the address to ping. You will then be given the option of sending unlimited pings, or a specified number. We strongly recommend sending between 4 and 10 pings in any one test. Click Ping to begin the test. You will then be presented with the result of each ping attempt, along with a summery of the statistics in the window below. From the top navigation of the Network Utility window, select 'Traceroute'. You will be presented with a singular field, in which you are prompted to enter a web, or IP, address. In the large window below you will be shown the route your connection is taking to our webserver. This can take a few minutes to complete.